A break from Scandinavia this week to have a look at a scheme shaping up in Stratford, East London. 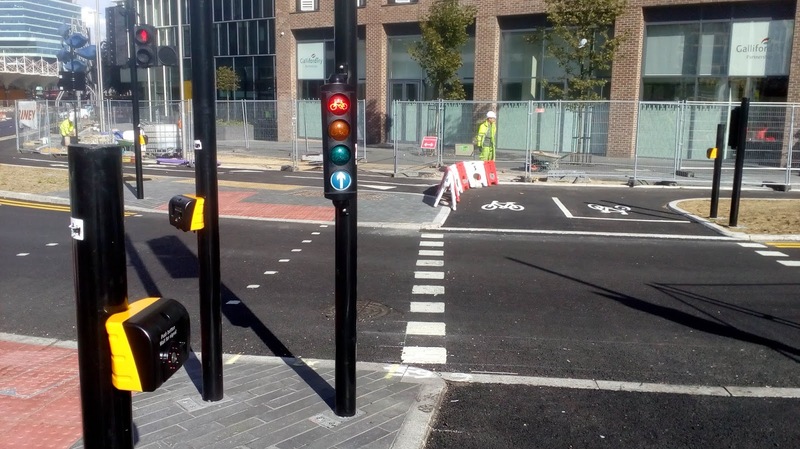 The Stratford Gyratory Scheme seeks to transform the town centre's streets and the cycling provision is looking very encouraging. First, I need to say that it's a work in progress and despite this, it's looking very good. There are some issues with it which need to be looked at again and there's couple of things that really need to be dealt with urgently. However, this is not a criticism of this transformative scheme, just the benefit of my engineer's eye for detail. The photograph above is of Broadway, looking westbound. 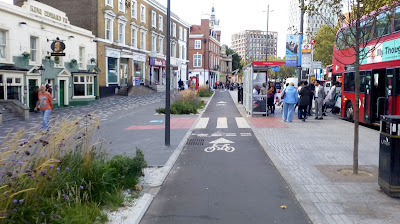 We have a 1-way cycle track nestled in between rain gardens and a floating bus stop/ parking bay. 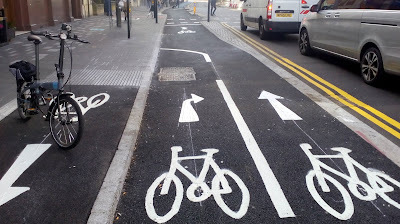 There is another 1-way cycle track for eastbound cycle traffic on the other side. Above is a view a little further along at the floating bus stop. 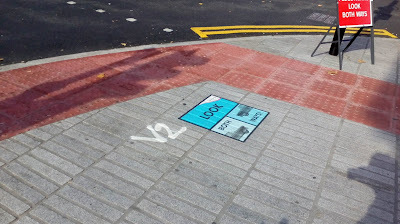 A zebra crossing is provided to provide help for those who prefer a controlled crossing to an informal crossing point. 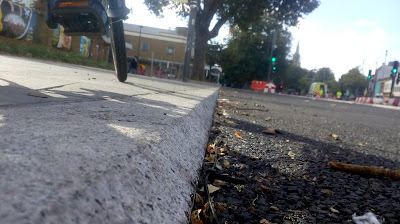 My first criticism is that of the choice of cycleway kerbs (above). 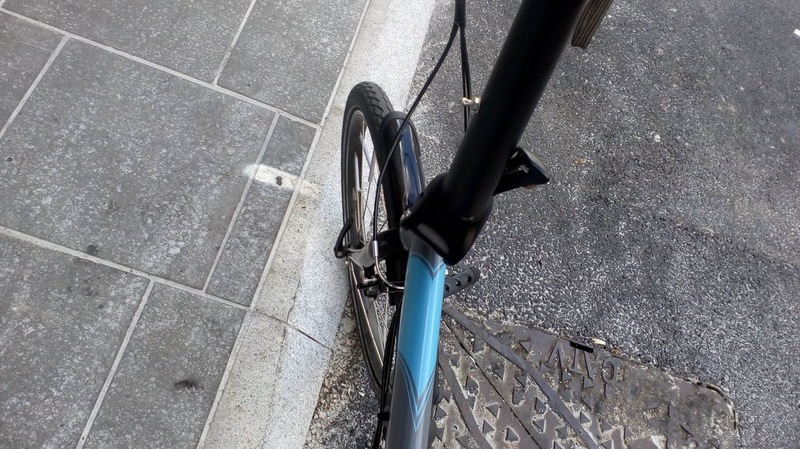 They have an upstand of about 25mm with a 45° splay. While it is far better than some of the pedal-catching lumps seen elsewhere in London, the splay is too steep and remains a wheel-grabber. For those using non-standard cycles or cycles as mobility aids, it's hard to bump up the kerbs which is what people would do in order to access shops and other premises. Because of the change to 2-way traffic and with new cycleways in parts of the town centre which didn't have them, there is a marketing campaign to remind people with floor stickers (below). I'm not a fan of the tactiles being cut in like this though. Here are two more issues (below). This is a parallel crossing over Great Eastern Road at the junction with High Street (circled green). 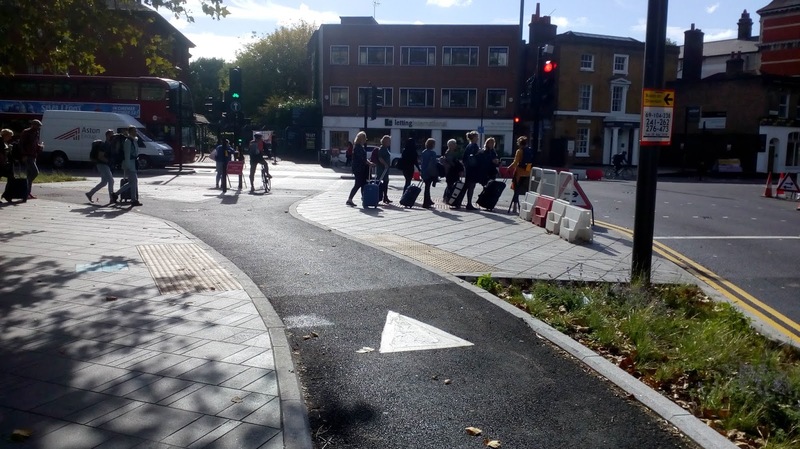 The parallel crossing at the end of the eastbound High Street has detection for cycle traffic, whereas the next crossing (below) has a push button. I cannot see why this doesn't have detection too. Chant Street is a side road off Broadway which connects to a neighbourhood. It was always filtered further into the estate, but now the filter is right next to Broadway and so it removes any need to take a motor vehicle in from the main road. 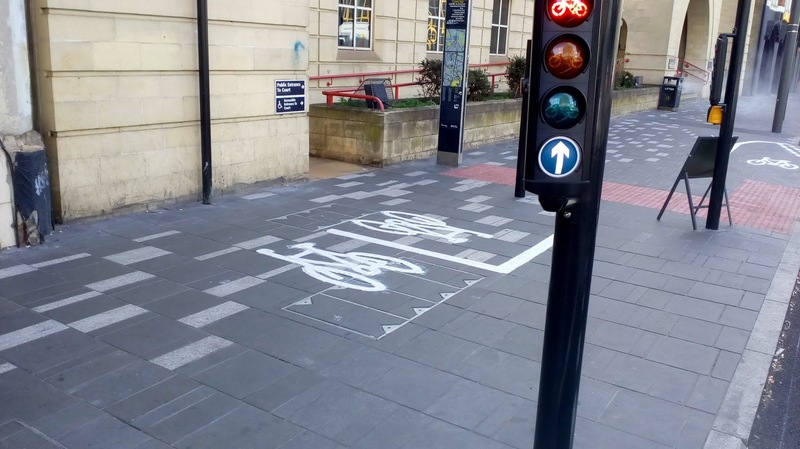 From a cycling point of view, the filter creates a little cycle junction which doesn't need any heavy engineering other than some give-way markings. 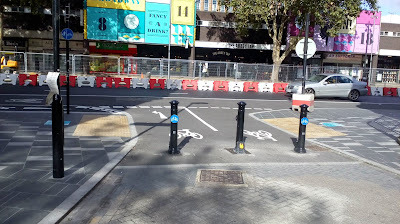 One issue which does need looking at is the filtering bollards. 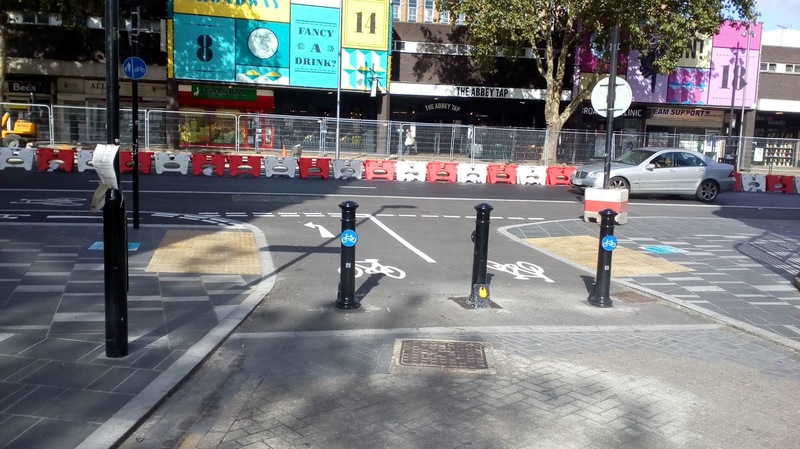 They looked a bit close to each other (1.5m clear gaps are required) and having bollards in the centre of the lanes is just dangerous. Setting them in from the main cycle track is good because people can pass through them before making a turn. 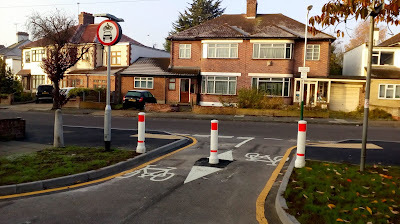 The centre bollard is for fire access and so a "road" of 3.1m (which is the width of a gateway for fire access under the Building Regulations) works well in terms of keeping the cycle route clear of bollards as far as possible as shown in the photo below. 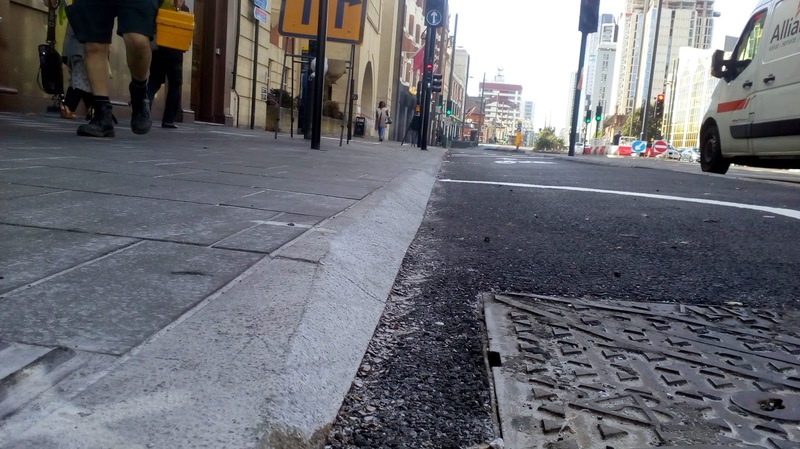 There is another design issue associated with Chant Street. Helpfully, the designers have thought about getting people cycling eastbound to Chant Street. 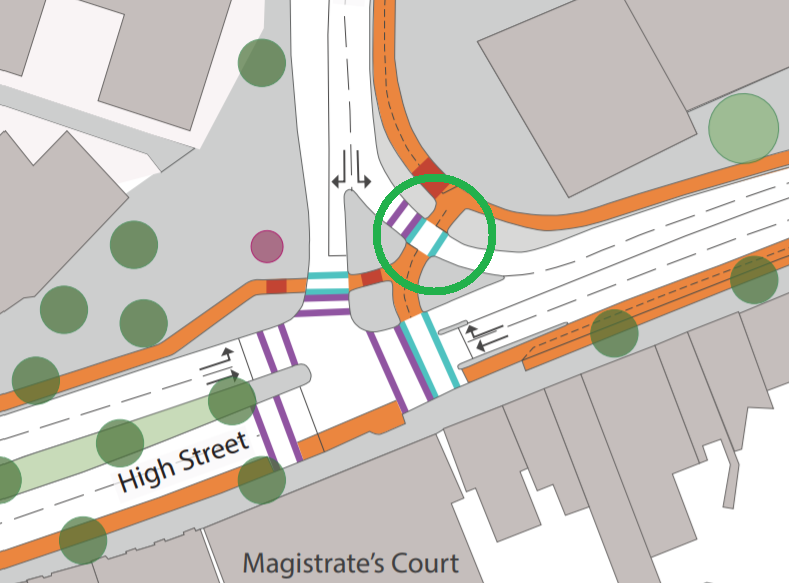 Rather than using another crossing opposite Chant Street (and so more signals), people cross earlier and use a short contraflow (in green, below). 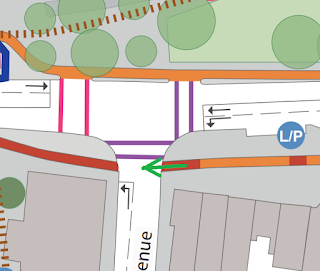 At the same time, people wishing to turn north from cycling west can use the crossing in the other direction (in red). Unfortunately, it's very fiddly. The photo above is roughly where my red and green lines cross, looking westbound. For people turning right to use the crossing, they are meant to pull left just where the chamber cover is. They then need to use a shared area to position themselves to cross (from left to right in this photo). If you look up as you approach this complication, there is a sign showing the route you need to take to head north (towards the station). 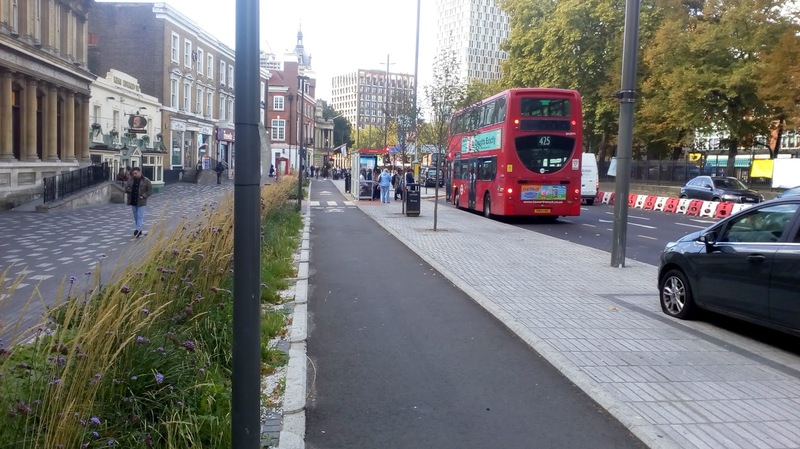 The problem is the arrow painted on the ground is confusing and the transition up from the cycle track to the shared area is a trimmed, but unforgiving kerb (next two photos). 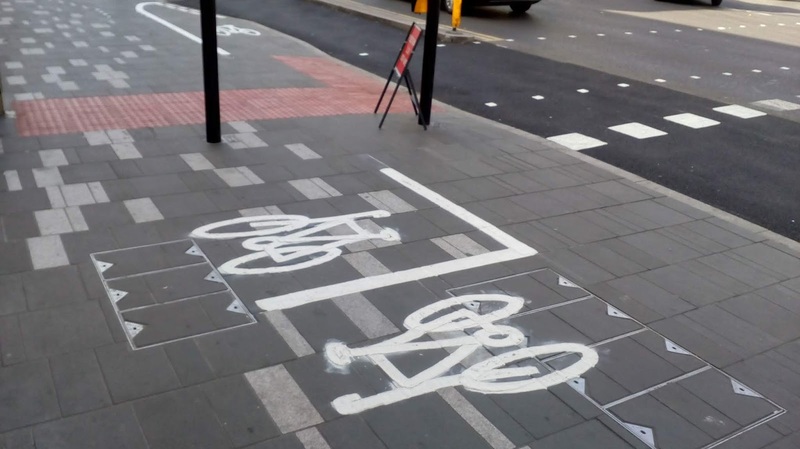 This urgently needs changing because it's dangerous. The stop line is there to guide you to a push button for the parallel cycle crossing. The problem is that it's an awkward turn and the push-button is a fudge because detectors would be set off by people walking past. 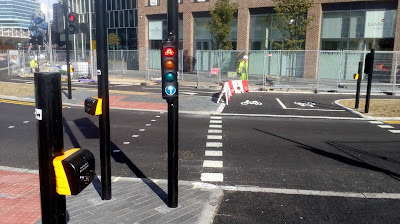 Having the push button here and people waiting to cross on cycles will block the footway somewhat. There is also another serious kerb issue here as the dropped kerb for the parallel cycle crossing has an upstand. As people move south (towards me in the photo) and then turn left to head to Chant Street, the kerb could grab a wheel. This needs to be urgently addressed. 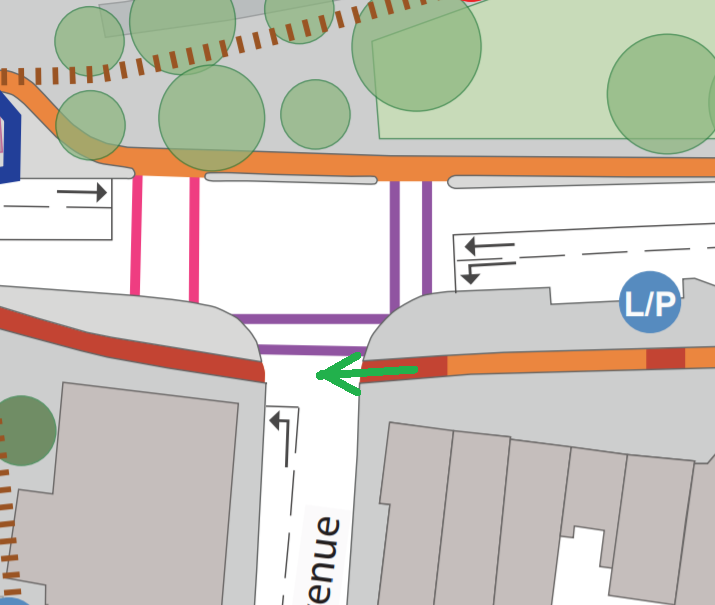 I do need to give this some more thought, but in some ways, I think another crossing opposite Chant Street would be better as it would remove the conflict from the current crossing. 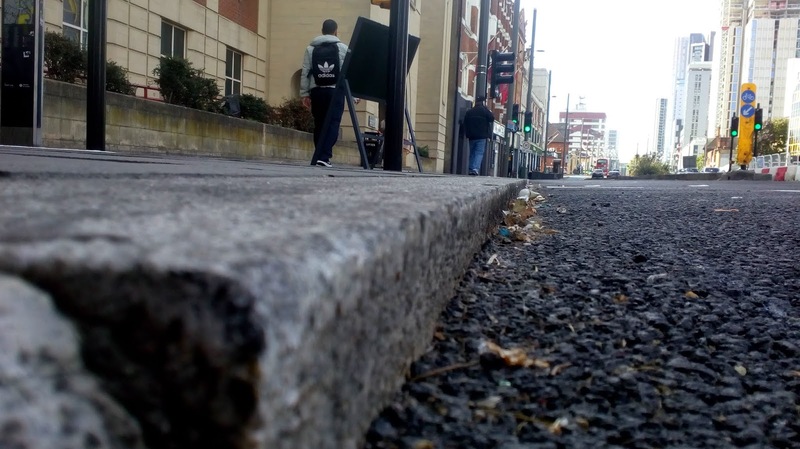 One other moan as well in relation to the surfacing. 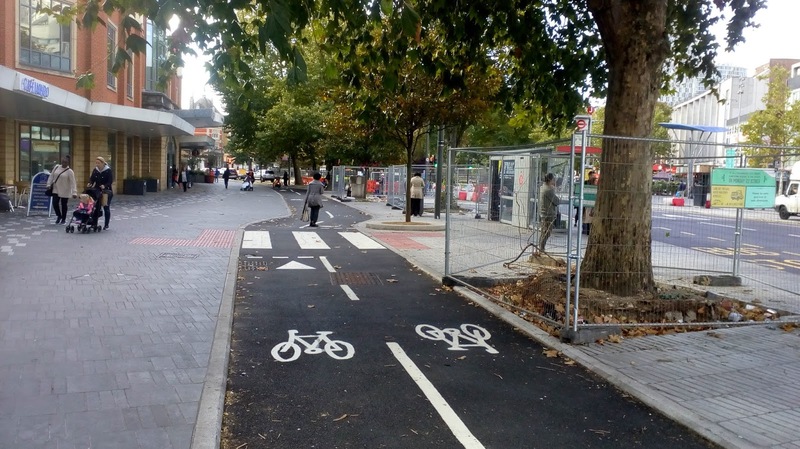 Some of it appears to be hand-laid and it just isn't smooth enough for a cycleway; on the other hand if it was machine-laid, then it needs to be condemned and redone. As I have often said, we should be using red surfacing for cycleways because it helps to show the routes to take and provides help for people not cycling in identifying the cycleways. The photo above was taken at The Grove which is to the east of the town centre. 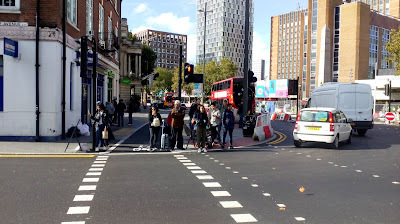 Here we have another floating bus stop with a zebra crossing over it. 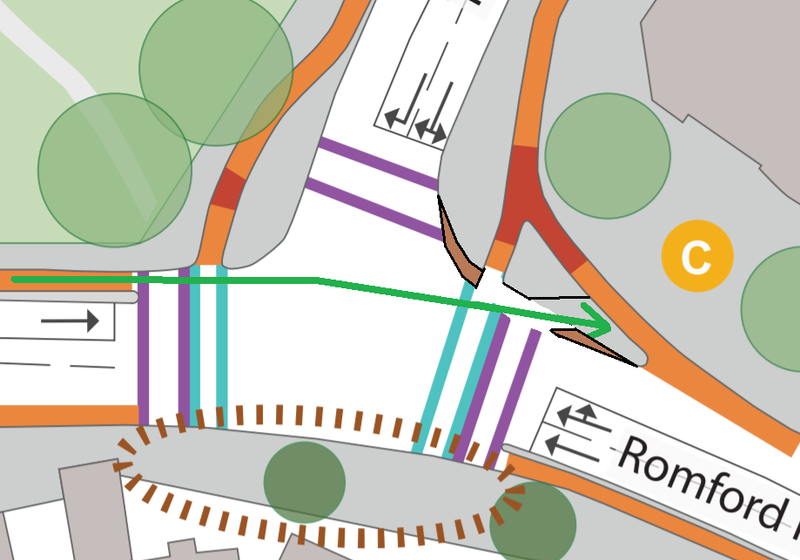 There are also some other compromises such as a shared area feeding a toucan crossing, although my guess is that conflicts will be far less of an issue as it's not the main east-west route. This final photo is from the southern end of The Grove. 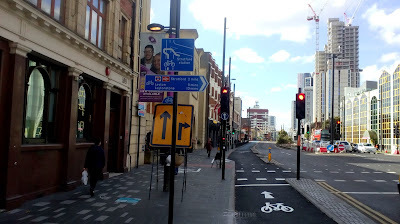 Cycling left sends you eastbound onto Romford Road where you are thrown back to the horrors of mixing with East London's drivers, although the transition protects as you turn. 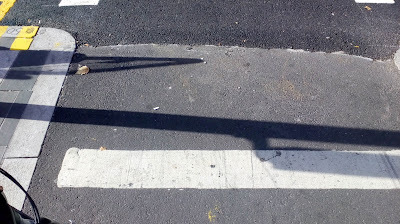 Moving ahead allows you to turn right into Broadway and head west. On other issue here is people on Broadway cycling east and entering Romford Road getting pinched by drivers doing the same - there needs to be an adjustment to provide protection here. 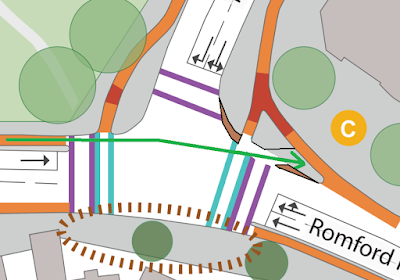 As you can see from my rough hack at the junction layout, the movement in green is the one which could be protected to allow merging onto Romford Road (extra islands formed in brown), rather than mixing with drivers. 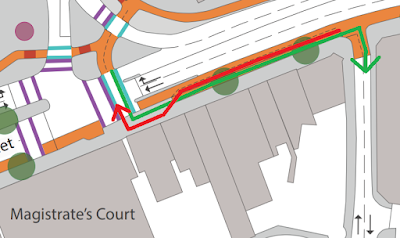 I know you're dropped back with traffic anyway, but it would be nice to get this detail right. OK, I have moaned about some of the scheme, but please don't let this detract from how utterly transformational it is for the area. Other than where CS2 starts/ ends, nobody would have really wanted to cycle around Stratford unless they had to. 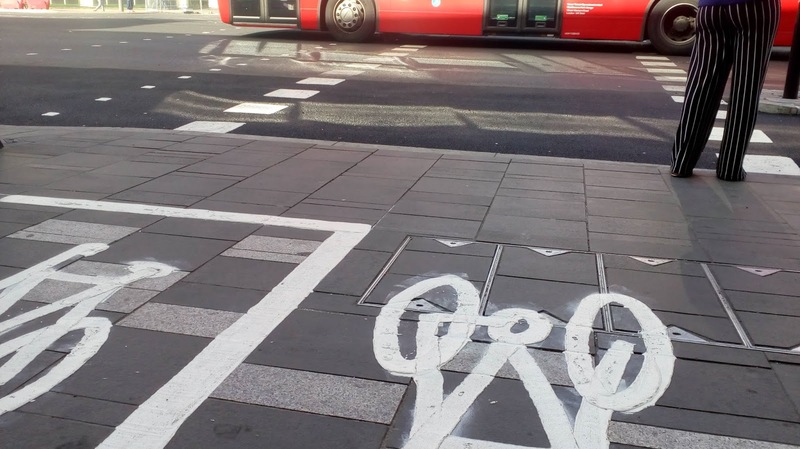 When this scheme is finished, it will make cycling around Stratford for every day trips really easy. I just hope Newham starts extending the protected network to the surrounding areas.